Children’s TV show Sesame Street have a nice line in spoofs – from Mad Men to err, the iPod advert. Maybe they’re trying to teach kids to be advertising-savvy, or maybe they just liked the colours and bouncy music. 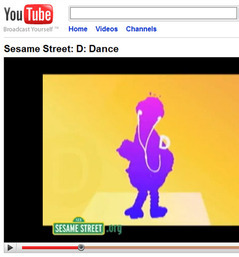 Anyway this is Big Bird with a “D” a music device that resembles the Apple product in more ways than one. Watch it! It’s pretty cute. The only danger is getting sucked into the Sesame Street Youtube Channel – the Elmo and Michelle Obama clip is a bit of a winner and don’t get me started on the Happy/Sad cookie episode..
We’re guessing Apple don’t mind – they’d look pretty bad taking issue with the company behind that towel-haired cutie Elmo. And it’s hardly Apple’s most recent advertising campaign.